Every once in a while, we experience an interesting coincidence where it seems as if our clients are telepathically synched, and we get a number of requests for the same thing. Such is the case this fall, and we are in the midst of designing not one, but three laundry rooms. Most laundry rooms feel like an afterthought -- just a large closet for the washer and dryer, without much consideration given to workspace or ergonomics. 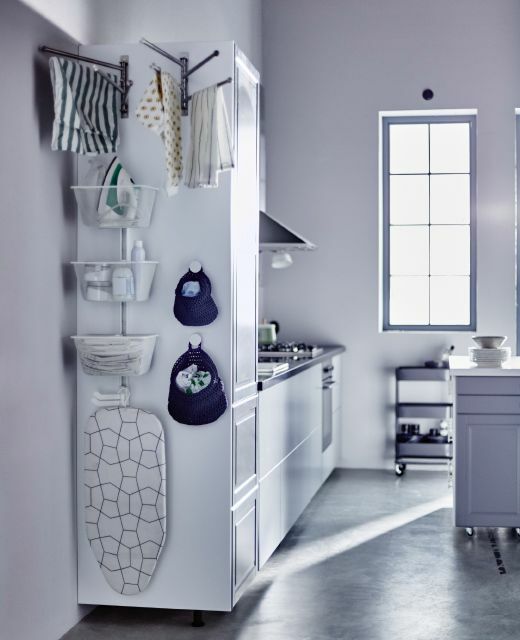 But this is an area of daily use, and all of its components – laundry sink & fixtures, drying racks, storage, and appliances – deserve as much thought and attention as the rest of the home. Below are items that we love seeing in a thoughtfully designed laundry. A dedicated space for folding laundry is important. If you don’t think about where this task will be happening, then before you realize it, your living room sofa, your bed or the guest bed becomes the default folding station. Not what anyone wants! One easy place to put a folding station is on top of a side-by-side front-loading washer and dryer. Build cabinetry around the units and place a countertop above. Be mindful of how tall your washer and dryer set are. Compact models are generally European-sized and made to fit underneath a standard 36” countertop. Larger capacity American-sized units are generally taller and therefore not as ergonomically suited for the average person. In this situation, consider a separate table that will be better for your back and shoulders. No room for a separate table? No worries -- we like transformable spaces and love using a table that can be quickly stored away. A gateleg table is a great option, and the Norden table from IKEA is one we’ve used in past projects. 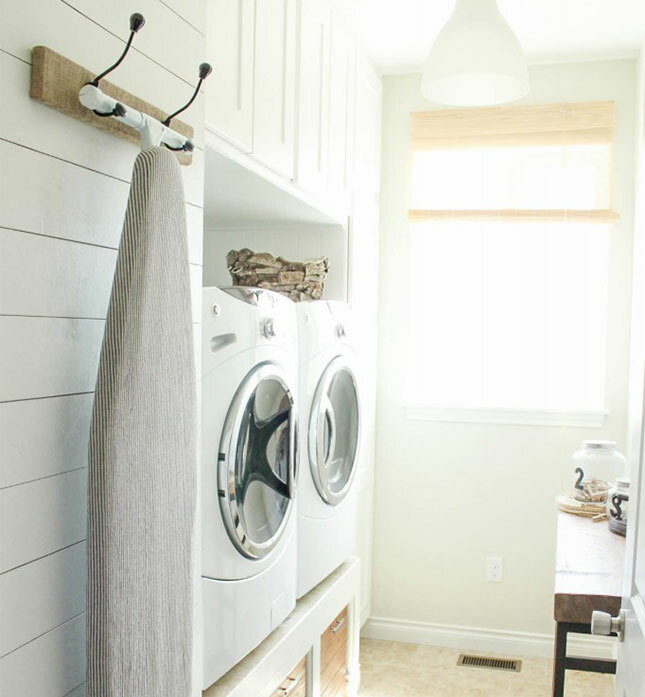 Not everything is meant for the dryer, but it can be challenging to find space for hanging these items. We love to capture the underutilized space on the ceiling by including a classic English drying rack, lowered and raised by a pulley. It’s an excellent way to keep things off the floor, elevated to warmer air, and it’s completely out of the way when not in use. Want to save even more space? A telescoping rack mounted to the wall is another nice option for small spaces and lighter-weight items. 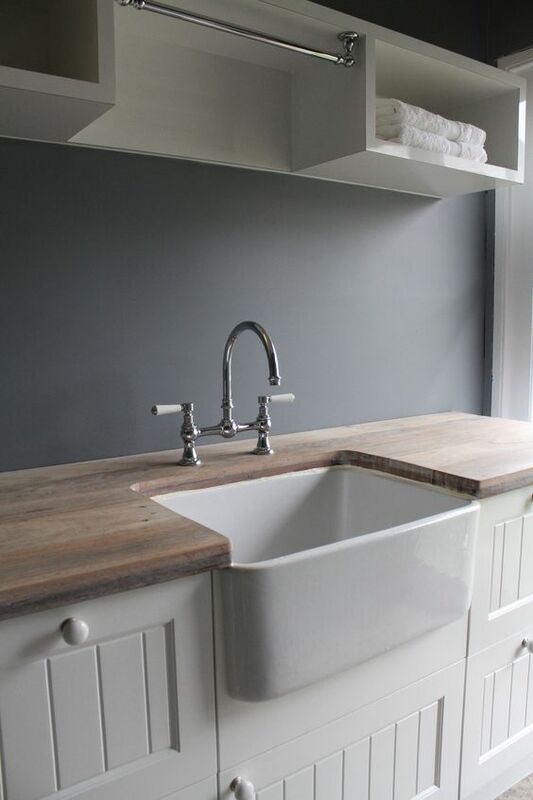 Choosing the right laundry sink and faucet is a matter of practicality as well as style. The two should complement each other, but the main consideration is good function for cleaning. We like to see high-necked, swivel and/or pre-rinse faucets in the laundry. These features are ideal for cleaning bulky items or stubborn stains. Do be aware that some of these faucets are taller than standard height, and proper cabinet clearance must be considered. The material of the sink itself should also researched and selected based on your personal cleaning style. Stainless steel, porcelain cast iron, and fireclay are the most common sink materials for laundry sinks, closely followed by granite composite. Do you anticipate soaking items in bleach? If so, then stainless steel or granite composite may not be the best material for you. The chlorine in the bleach reacts with and corrodes the stainless, making it appear blotchy and dirty – not the clean look one hopes for in a laundry room. But if you typically eschew chlorine bleach and use more green-friendly cleaning products, then a deep, professional sink may be a great choice, and some fantastic options can be sourced from kitchen supply stores. 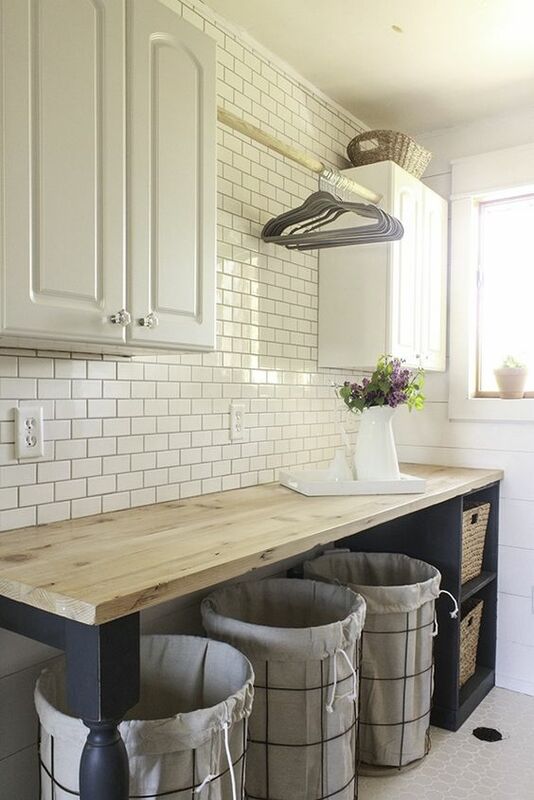 While most people envision a deep fireclay sink in the kitchen, these are also workhorses in the laundry room. They look great and clean easily, but don’t scrub them too aggressively, as they have a slick glaze coating that keeps them looking polished. Avoid steel wool and harsh abrasive scrubbers that can remove this protective layer. An easily accessible ironing board is much more likely to be used instead of one shoved in a closet or behind a washer. Make the very task of ironing more pleasant by giving it a designated place. Compact ironing boards are good for quickly touching up clothes and may be laid upon a tabletop, while full-sized boards are great as well for those of us who like to iron large items, like sheets or tablecloths. For many of our clients, installing a folding ironing board in a drawer or a cabinet is an ideal solution. It allows you to tuck your ironing board neatly away and provides a stable and stationary ironing station without taking up any additional room. If you are without cabinetry in your laundry, a wall-mounted folding unit is another wonderful option. With an ironing board that drops down from inside, these are also typically equipped with a task light and an outlet for plugging in your iron. 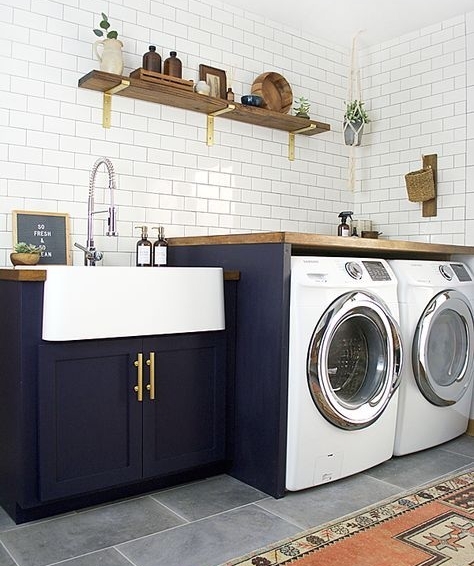 Though these do not technically fall under the realm of interior designer recommendations, we feel that a good laundry room deserves to be equipped with good appliances. An iron will be used almost daily (in theory), and it should be well made with useful functions. We are both obsessed with Rowenta irons. They are well engineered, properly weighty, and have excellent steam functions. Our only extra advice is to verify where each model is manufactured. The German-made models are fantastic. Full-sized garment steamers are a big investment, but if you are serious about your laundry, then go for it! If you haven’t got space for one, we like travel steamers. They’re small enough to fit in a cabinet and we can take them with us on the go.